I began writing a eulogy for Berta Isabel Cáceres Flores years ago, though she died only this month. Berta was assassinated by Honduran government-backed death squads on March 3. Like many who knew and worked with her, I was aware that this fighter for indigenous people wasn't destined to die of old age. She spoke too much truth to power -- for indigenous rights, for women's and LGBTQ rights, for authentic democracy, for the well-being of the earth, and for an end to tyranny by transnational capital and U.S. empire. Berta cut her teeth on revolution. She was strongly impacted by the broadcasts from Cuba and Sandinista-led Nicaragua that her family listened to clandestinely, gathered around a radio -- with the volume turned very low, since those stations were outlawed in Honduras. Always a committed leftist, Berta's mother raised her many children to believe in justice. Do-a Bertha -- the mother made her youngest child her namesake -- was mayor of her town and governor of her state back when women were neither, in addition to being a midwife. She was Berta's life-long inspiration. As a young adult, like so many others from the region who shared her convictions, Berta went on to support the Salvadoran revolution. In 1993, Berta -- a Lenca Native -- cofounded the Civic Council of Popular and Indigenous Organizations of Honduras, or COPINH. At that time in Honduras, there was little pride and even less power in being indigenous. Berta created COPINH to build the political strength of Lencas, campesinos, and other grassroots sectors to transform one of the most corrupt, anti-democratic, and unequal societies in the hemisphere. Berta loved to say, "They fear us because we're fearless." The fearlessness paid off over the years. COPINH has successfully reclaimed ancestral lands, winning unheard-of communal land titles. They've stalled or stopped dams, logging operations, and mining exploration -- and not to mention free-trade agreements. They've prevented many precious and sacred places from being plundered and destroyed. In addition to Berta's remarkable leadership, COPINH's victories have come through their size, strength, unity, and fierce commitment. Communities have participated in hundreds of protests, from their local mayors' office to the steps of the national congress. They've occupied public spaces, including several of the six U.S. military bases in their country, and refused to leave. They've shut down the road to Tegucigalpa, strategically blocking goods from moving to the city. They've declared a boycott of all international financial institutions on their lands. They've helped coordinate 150 local referendums to raise the stakes on democracy. Here's one of many tales that Berta told of strategies and actions. The backstory is that Honduran farmers -- which most COPINH members are -- wear thick work boots made of unventilated rubber. Over their course of containing sweaty feet, they come to smell horrendously, so bad that their owners often refer to them as bombas, or bombs. Early in COPINH's history, a team went from La Esperanza to Tegucigalpa to negotiate with the government on a land titling law. The discussions went on for days. Berta recalled that, during lunchtime, the government received lavish, catered meals; the COPINH members had no money, and so their side of the table stayed empty. Far less connected in those days, the group had nowhere to sleep or shower, and spent the nights in the streets. At one point, the negotiations were tense and the members of COPINH's team were shaky on their strategy. They asked for a recess, but the government refused. So someone on the COPINH side gave a discrete signal, and altogether the farmer-activists pulled off their bombas. The smell was so toxic that the government officials fled the room. COPINH was able to regroup and develop a stunning strategy. The indigenous radicals won the law. The most recent campaign -- which yielded a partial victory -- was likely the proximate cause of Berta's death: stopping the Agua Zarca dam project on a sacred Lenca river. The COPINH community of Rio Blanco -- everyone: men, women, elders, toddlers, nursing mothers -- formed a human barricade and blocked construction of the dam. Meanwhile, Berta, other members of COPINH, and national and international friends pressured the World Bank and the largest dam company in the world, Chinese state-owned Sinohydro, to pull out. Rio Blanco didn't just blockade the construction for an hour or for a day, or even for a week. They did it for more than a year. They did it until they won. They got the most powerful financial interests in the world to abandon the project. Tragically, because other financial interests are always waiting in the wings to plunder for profit, the dam is still under construction. Forty-eight more are either planned or underway on their lands. Berta's belief in participatory democracy extended profoundly to her everyday practice. As the unparalleled leader of COPINH, and with a large gap between her own level of education and political experience and that of all but a few in the group, it would be have been easy for her to act on her own. Yet she always made herself accountable to the communities she worked for. I saw the degree of this commitment in action one night when Berta called in to Utopia, COPINH's rural community meeting center, and asked to speak to everyone. Fifteen or so people quickly gathered around the cell phone on the shaky wooden table next to the only light, that of a candle. Berta explained a fairly pro forma request that had come to her from a government office, and proposed a response. When she was finished, she asked the almost exclusively illiterate group, "¿Cheque s', o cheque no?" All raised their thumbs toward the little cell phone and called out, "S'!" No joint decision had been required, and yet she'd sought consensus. Berta was unflappable. She was calm in the face of chaos and strategic in the face of disaster. She got right in the face of soldiers and goons when they showed aggression toward her or others, and told them what was what. Berta was indefatigable, working around the clock with no complaint. When not traveling around Honduras or the world to raise support for the struggle, she would wake early and go straight to her desk to receive updates, often on the most recent attacks on COPINH members, and in those cases to write condemnations -- all even before a cup of coffee. She would then jump into her yellow beater truck to pick up other members of COPINH and head off to wherever action or investigation was needed. I was amazed that Berta drove that noteworthy truck everywhere without protection, and that she lived in a house secured by only a small bolt and a couple of friendly dogs. Then I realized that it made no difference how much security she had. Though Berta also spent periods in deep hiding, the government and the companies she opposed almost always knew where she was -- and how to get her when they were ready to kill her. Berta took two small breaks in her life. The first was a two-week vacation with a friend in a neighboring country, the second a three-month semi-repose at my house in Albuquerque -- though even then, she spent most of her days building a continent-wide boycott of the World Bank and Inter-American Development Bank. Even as she served her community, Berta rose in the past decade to become an international people's diplomat. She was a heroine to many global movements, a critical player in many struggles, a keynote speaker at many venues. She was someone consulted by government officials, by international networks, and even, a few months ago, by Pope Francis. As we watched Berta's rise as a global leader, our close friend and colleague Gustavo Castro commented to me, "I hope she never loses her humility." She never did. I once asked Berta how to say "integrity" in Spanish. She translated it coherencia -- coherence between one's stated principles and actions, coherence amongst all parts of one's life. Berta had coherence. She was highly critical of U.S. Americans for our lack of that coherence. She once led an anti-oppression training for an organization I was running, in which she asked us to examine whether we were Caesars or artisans. She meant whether our practice -- and not just our statements -- aligned us with the oppressors or with the oppressed, and whether we were promoting the grassroots or ourselves as leaders. For a long time after, the refrigerator that Berta and I shared held her line drawing of a thonged Roman sandal. She commented to me once that the problem with U.S. Americans is our attachment to comfort. Berta herself eschewed comfort. She lived in the modest house in which she was raised, where she cared for her elderly mother. She slept in a bare cement room, more than half of which had been converted to her office, housing her desk with its mountain range of documents and small computer table. Her trademark style -- regardless of with whom she was meeting -- was jeans, sneakers, and a cotton shirt. She didn't shop, go to fancy restaurants, or take a plane when a bus was available. Besides COPINH and the struggle for justice, Berta had another profound commitment: to her mother and her four children. I recall watching the deep pride on Berta's face when one of her daughters, then only 7 or so, recited a poem, "Las Margaritas" (The Daisies), for a group of foreign visitors; it was a very different expression from any other I'd ever seen from her. She grew prouder as her three daughters and son grew older, all of them holding the flame for justice. Following Berta's murder, her children and mother issued a statement in which they said, "We know with complete certainty that the motivation for her vile assassination was her struggle against the exploitation of nature’s commonwealth and the defense of the Lenca people. Her murder is an attempt to put an end to the struggle of the Lenca people against all forms of exploitation and expulsion. It is an attempt to halt the construction of a new world. "Berta’s struggle was not only for the environment, it was for system change, in opposition to capitalism, racism, and patriarchy." Back in 2013, after the Honduran government dropped sedition charges against Berta -- one of its countless attempts to silence her -- someone asked her mother if she was scared for her daughter. Laughing, Berta quoted her mother's response: "Absolutely not. She's doing exactly what she should be doing." Berta's humor was legend. A joke from her, and her soft up-and-down-the-scales laugh, punctuated the most tense of moments and kept many of us going, even as she never strayed from the gravity of the situation. One of her jokes was recirculated recently by radical Honduran Jesuit priest Ismael "Melo" Moreno. He once accompanied her to Rio Blanco, where someone snapped a photo of them together. As she peered at the picture, Berta laughed and said to Melo, "Let's see which of the two of us goes first." When Berta saw a performance of the Raging Grannies, a group of elder women who dress up in outrageous skirts and joyously sing protest songs at rallies and events in Albuquerque, she told me, "I never wanted to live to be an old woman. Now I do." That chance was just taken from her. One person witnessed Berta's assassination: Gustavo Castro Soto, coordinator of Otros Mundos Chiapas/Friends of the Earth Mexico, coordinator of the Mesoamerican Movement against the Extractive Mining Model (M4), and co-founder and board member of Other Worlds. A close friend and ally of Berta, Gustavo slept in her house on the last night of her life to provide accompaniment in the hope of deterring violence -- something dozens of us have had to do for her over the years. Gustavo was shot twice and feigned death. Berta died in his arms. Gustavo was immediately detained in physically and psychologically inhumane conditions by the Honduran government, and held for several days for "questioning." The subsequent days have resembled a bad spy movie, with Gustavo finally given permission to leave the country, only to be seized at the migration checkpoint at the airport by Honduran authorities, then placed into protective custody in the Mexican Embassy -- only to be handed back to the Hondurans once more, who took him back to the town of La Esperanza for more "questioning." The Honduran government has declared that Gustavo must stay in Honduras for 30 days. He is being "protected" by the Tigers, vicious U.S.-funded and trained "special forces." Chillingly, according to the State Department, the United States is cooperating with the Honduran investigators. A note from a close colleague, from outside Gustavo’s place of detention, said that a team of U.S. "FBI types" were actually in the interrogation room. The role of the U.S. government in the attempted destruction of social movements in Honduras is vast. One can draw also draw a straight line from Washington to Berta's death. But that's the topic of another article. Gustavo continues to be in terrible danger in Honduran custody, as what he witnessed is an impediment to the government’s deceptive attempts to pin Berta’s murder on COPINH itself. In a note to some friends on March 6, Gustavo wrote, "The death squads know that they did not kill me, and I am certain that they want to accomplish their task." The Honduran government also imprisoned COPINH leader Aureliano "Lito" Molina Villanueva for two days just after Berta's murder, on "suspicion in a crime of passion." Authorities are interrogating COPINH leaders Tomas Gomez and Sotero Chaverria as well, while denying them lawyers. This is part of an effort to criminalize COPINH members. Now, COPINH needs more than ever to be protected, to be supported, and to carry on the legacy that Berta helped to build. Berta touched everyone she met, and even countless ones she didn't. My young daughter is one of those. The morning of Berta's death, she wrote this: "I was shocked, because how can somebody kill someone who was only trying to do what's right? Then I remembered they killed Martin Luther King and Malcolm X. If I die for doing the right thing, that would let me know that I did my part in this world. Just like Berta." When Berta received the 2015 Goldman Prize, the most prestigious environmental award in the world, she dedicated the prize to rebellion, to her mother, to the Lenca people, to Rio Blanco, to COPINH -- and "to the martyrs who gave their lives in defense of the riches of nature." Berta, Gustavo, and I co-founded the grassroots network Convergence of Movements of the Peoples of the Americas (COMPA) in 1999. Early on the horrific morning of March 3, a COMPA listserv note blasted the news of Berta's assassination. Reading that message, I spotted the posting just prior, dated February 24. It was from Berta. It read simply, "Aqui!" I am here! 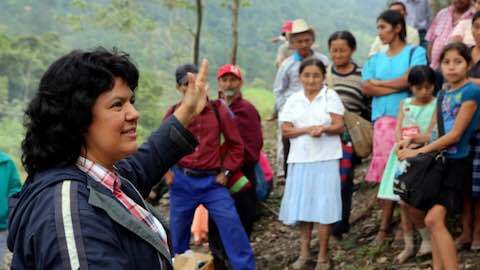 Latin America: "Berta Cáceres, Presente!"